Werner Herzog has been making films for 50 years, and when an artist lasts that long, the distance between his original defining self and his latest work can be dizzying. For instance, who could have predicted Herzog would become a kind of holy-oddball celebrity, renowned for his films but also for his sonorous all-purpose voice, his unexpected acting roles (bothering Tom Cruise in Jack Reacher), and his presence in inexplicable encounters (pulling Joaquin Phoenix from a car wreck in Los Angeles; being shot with a BB gun in the middle of a TV interview)? We seem to be living in Herzog’s world. As for the films themselves, consider that when he reached his full powers in masterpieces such as Aguirre, the Wrath of God (1972) and The Enigma of Kaspar Hauser (1974), he was working in a raw, mystic style that examined man and nature in a strange new way. It’s not even close to Herzog’s complete output and it leaves out many of Herzog’s most interesting and offbeat non-fiction films (perhaps a second volume will follow if sales are good enough?) but it includes the major films Herzog created in the period, including both the German and English language versions of Nosferatu, which Herzog shot concurrently. The films in the set were produced and financed by Herzog and he remains ownership of them all. Let’s take a tour through them. Not necessarily in chronological order. Even Dwarfs Started Small (1970) is the earliest film on the disc and Herzog’s second feature, and Fata Morgana (1971), is his third fiction feature, a dreamy non-narrative meditation on the beauty of the Saharan Desert and the garbage brought to it by humanity. Both of these films, by the way, have commentary by Herzog in conversation with Crispin Glover, which is a highlight all in itself. Werner Herzog’s breakthrough film Aguirre, the Wrath of God (1972) is an astounding vision of imperialism run amuck in the primitive, savage Eden of 15th century Peru and the film still entranced four decades thanks to the vivid, visceral filmmaking. It’s also Herzog’s first collaboration with madman and meglomaniac star Klaus Kinski, who delivered the most expressive performances that visionary director Werner Herzog ever put to film. 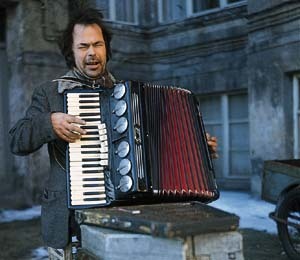 Herzog in return gave Kinski his boldest roles. This collection features all five collaborations between the director and the actor, plus Herzog’s documentary tribute to the actor. In Aguirre, the Wrath of God, Kinski stars as a mad Spanish conquistador searching for the mythical city of gold El Dorado. The imagery is astonishing: jungles layered in mist and fog, broken by a glittering train of armored soldiers with their slaves, their guns, and thrones carrying improbably dressed and coiffed noble women. 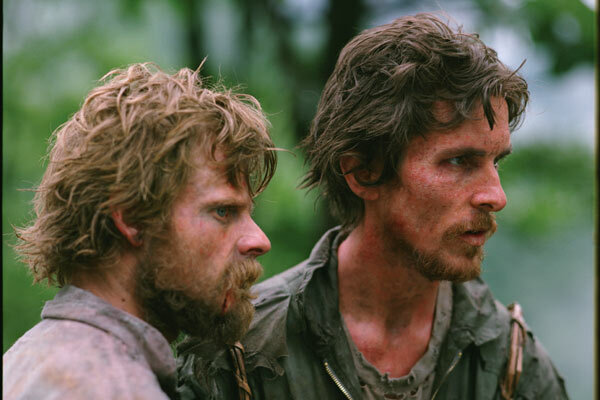 His vision comes alive in Kinski’s feral, furious evocation of a lunatic soldier overcome with delusions of Godhood. The film’s final scene, with the raving Aguirre reigning over a kingdom of spider monkeys adrift on a raft, is one of the greatest images of man adrift in madness ever put to film. They reunited in Nosferatu the Vampyre (1979), Herzog’s remake of F.W. Murnau’s silent vampire classic in chilly color: chalky whites and murky midnight colors both faithful to Murnau and quintessentially Herzogian. It’s the same disc that Shout Factory released separately a couple of months ago, and the only to have been previously released on Blu-ray in the U.S. I reviewed it for Parallax View here. 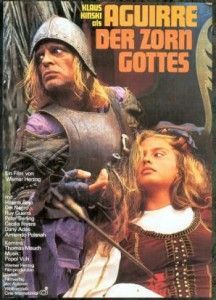 It features both the German language and English language version, which were shot separately but simultaneously with the actor slipping from one tongue to another. The differences are minor but noticeable. Kinski, Adjani and Ganz are rather uncertain and stilted in their English delivery, giving them an off-putting aloofness that makes this version more dreamy and detached. The German readings are warmer and easier, giving the characters a flesh and blood anchor, though French actress Adjani is dubbed by another actress. Shot a mere five days later, Woyzeck (1979), adapted from Georg Buchner’s play about a soldier pushed to the point of madness, is a stark, bleak vision. Kinski’s feral face is haggard, tortured, twisted in desperation as a tormented garrison soldier who submits to scientific experiments. It’s his most vulnerable and sad performance, but Herzog pulls back from intimacy with a handsome but removed style. Werner Herzog’s most ambitious undertaking Fitzcarraldo (1982) is this dreamer’s most impressive look into the obsessive drive of another dreamer. Kinski is less demonic and delirious than previous Herzog heroes as the Irish opera lover in South America determined to bring Caruso to the jungle. 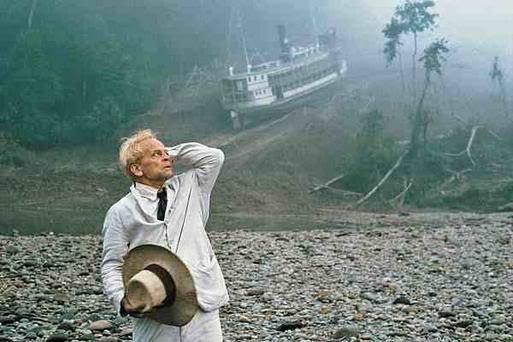 In this epic of European exploitation and tribal mysticism, Kinski is dwarfed by the majesty of the jungle and enormous scale of the film’s set piece: hauling the steamboat over a heavily overgrown mountain slope with rope, pulley and sweat, an act Herzog performs for the camera for real–and it shows. In their final collaboration Cobra Verde (1988), Kinski is a 19th century Brazilian bandit sent to Africa to re-open the slave trade, where he raises an all-girl army that makes him a powerful force on the African coast. 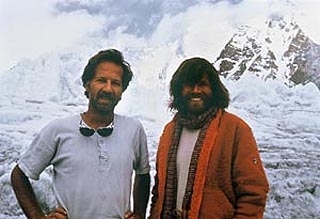 Kinski died in 1991, but their love/hate bond was too great to end, so Herzog paid strange tribute to the madman with the documentary My Best Fiend (1999). Stories of their volatile clashes and plots to kill one another are legendary and Herzog admits that they brought out the both the artist and the beast in each other. Herzog seems reluctant to dig too deep into their combustible relationship, but his portrait of Kinski manages to capture his extremes, from Kinski spitting and cursing at a booing audience on his so-called “Jesus” tour to a smiling child-man with the butterfly kissing his face. Picking out the leftover oddities we have Heart of Glass (1976), famed as the film where Herzog hypnotized the entire cast before turning on the camera. 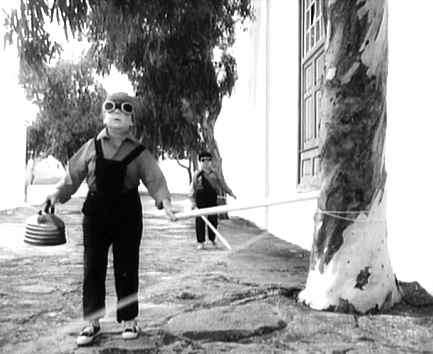 The result gives this mystic tale of a Bavarian village gripped in madness a trance-like quality. And he went to the Australian Outback for Where the Green Ants Dream (1984), specifically a sacred spot where an Aboriginal tribe takes a stand against a mining company transgressing their culture. And there are four additional documentaries. 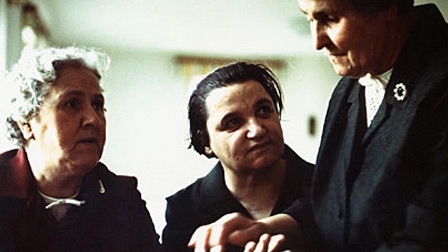 Land of Silence and Darkness (1971) explores the world of the deaf-blind through the life of a 56 year old woman, Fini Straubinger, who has been deaf and blind since her teens and now works to help others similarly afflicted. Ballad of the Little Soldier (1984) looks at the persecuted Mikito Indian tribe of Nicaragua. Lessons of Darkness (1992) is a portrait of the oil fires set by the retreating Iraqis in the wake of their invasion of Kuwait and a visually stunning film essay on the power of nature in a man-made catastrophe. I wrote about Lessons of Darkness for Keyframe a couple of months ago. Finally, Little Dieter Needs to Fly (1997) is the story of German helicopter pilot Dieter Dangler, who was captured and imprisoned by the Vietcong during the Vietnam war and returns with Herzoz to Vietnam decades later to tell the story of his escape and even reenact some of his experiences. Shackled and marched through the jungle, the balding, middle-aged Dengler quietly confesses “You can’t imagine what I’m thinking.” He’s right, but it doesn’t make the scene any less disturbing, or his survival (in both body and spirit) any less extraordinary. Herzog later retold the story in dramatic form. These are not necessarily restored editions. They are, however, high quality masters from primary elements from Herzog’s own archive. According to Shout Factory, they were (but for two films) all scanned from the original negatives or the original 16mm CRIs (Camera Reversal Intermediate). The results are a significant upgrade from the previous DVDs released almost a decade ago. 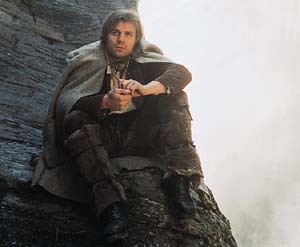 There are no new supplements created for this edition but Shout Factory got the rights to the commentary tracks Herzog recorded for the earlier Anchor Bay DVD releases of Even Dwarfs Started Small (with guest commentator Crispin Glover), Fata Morgana (again with Glover), Aguirre the Wrath of God, The Enigma of Kaspar Hauser, Heart of Glass, Strozek, Nosferatu the Vampyre, Fitzcarraldo (with producer Lucki Stipetic) and Cobra Verde and German-language commentary tracks (with English subtitles) recorded with Laurens Straub for the German disc releases of Aguirre the Wrath of God, Nosferatu the Vampyre, Fitzcarraldo and Where the Green Ants Dream. Also includes the English-language documentaries Portrait: Werner Herzog (on the Woyzeck disc) and Herzog in Africa (on the shooting of Cobra Verde) and the German-language “In Conversation” interview with Herzog conducted by Straub. Shout Factory collects it all in a handsome bookleaf folder with a 40-page booklet featuring essays, film notes and photos and sturdy paperboard leaves with the discs in individual pockets. It’s very nice package, easy to access and very protective of the discs, and the dimensions (a 7 ½ square) will fit on most shelves. The release is limited to 5000 copies. “A planet in our solar system. Wide mountains ranges, clouds, a land shrouded in mist.” The landscape of Lessons of Darkness at first glance looks like the desert counterpart to the Carpathian Mountains of Werner Herzog‘s Nosferatu: Phantom der Nacht, a land shrouded in myth as much as in mist. But those initial ethereal images give way to a wasteland of death and fire. It could be a primordial planet in the throes of it birth or the aftermath of an apocalyptic war that has left the planet dying, choking on its own blight. In 1990 Iraq invaded the tiny, oil-rich desert kingdom of Kuwait on the Persian Gulf and occupied the country until an international military coalition led by the United States drove the Iraqi army back over the border. The Iraqi forces set fire to over 700 oil wells in their retreat. It was an ecological disaster, polluting the skies with thick black smoke and soaking the sands in a smothering slick of spilled oil. The inferno burned for eight months before the last of the fires were extinguished. 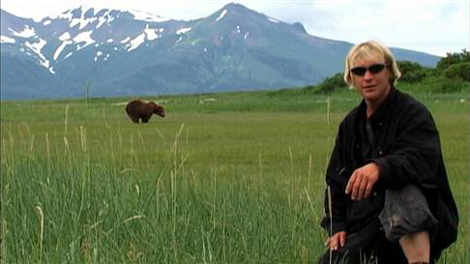 It’s easy to see why Werner Herzog was so fascinated by Timothy Treadwell, the former beach bum turned self-made wildlife activist and grizzly bear guardian who spent thirteen summers living amidst the grizzly bears of the Katmai National Park and Preserve in Alaska until he, along with his girlfriend and traveling partner, Amie Huguenard, was mauled, killed, and devoured by his beloved cause. As his documentary Grizzly Man suggests, Treadwell saw himself as a new-age Grizzly Adams with a video camera and a quest to save the habitat from humanity. He could be a real life folk version of the dreamers from Herzog’s dramas, less manic and not as prone to epic gestures but no less obsessed. Treadwell relentlessly videotaped his sojourns and the magnificent footage that he left behind captures a serenity and savagery of the wilds at times reminiscent of Herzog’s best films. But the footage also serves his self-made mythological identity—”the lone guardian of the grizzly”—by constantly and pointedly placing himself in every shot, like the host of a non-existent nature show/nature reality series. His footage is accompanied by grandiose stream-of-consciousness running commentary, a mix of naturist idealism, poetic romanticism and a kiddie-show host blissing out on the wonders of mother nature. He speaks of the isolation of his solo forays into the wilds, even though he was accompanied and assisted by female partners/girlfriends on practically every trip, and is careful to never mention their presence, let alone allow them to share credit in his adventure. Amie, the girlfriend who was killed with Treadwell, is only glimpsed only twice in the background of footage Treadwell left behind, and even there is barely present.